Lindsaylew82 wrote: I think Lakngulf did this once with concrete wire on his non-lake garden. I can't find the post, but maybe he will post a link here. Why is it that in the first photo you say they don't have leaf protection over the fruit? Is it that the panels are low and the plants double over once they're through the panel? Not quite sure I understand. I get the not being able to really tackle the weeds underneath, but am not sure I'm getting your first point. KitchenGardener wrote: Why is it that in the first photo you say they don't have leaf protection over the fruit? Is it that the panels are low and the plants double over once they're through the panel? Not quite sure I understand. I get the not being able to really tackle the weeds underneath, but am not sure I'm getting your first point. Glad you like the jungle. I tried to walk between the rows yesterday and it is quite difficult. With the flat cattle panels, you are correct, the plants just lay down once they are thru the panel. They put on LOTS of tomatoes, and they are left wide open to the sun. To address the high winds I have had luck with a pvc structure and very thin cloth anchored with big bull dog clips. Also, as per the wind and string cutting the plants, I found green Velcro (sold at nursery) that allows you to easily support the plant and change your mind as the vines grow. - Inexpensive especially when I already have 7ft 3/4” bamboo stakes and fence posts — Florida Weave with untreated jute and/or cotton kitchen twine. — Pros - Easy cleanup at end of season. Cons - need to keep stringing upper tiers of support. Sags. - Sturdy once and done — concrete Remesh panels (or livestock panels — but for me, these are too long and can’t easily be transported) secured to heavy duty T-posts. - Less expensive option - wire fence roll secured to T-posts. And looking through the thread looks like there are a quite a few methods with varying results not to mention different varieties. I have tried quite a bit of different methods and finally have one that works for me. Texas Tomato Cages, I love the fact that I walk by the cages every day or every other day and just push the new growth inside for support. 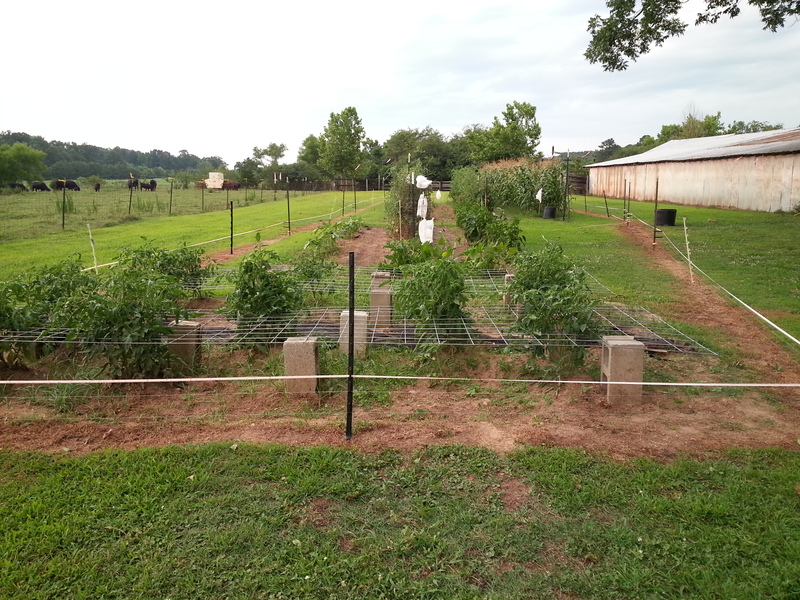 Cost was a bit rough, but the fact that I only grow 10 or less tomato plants made the decision easier. I felt that I earned the right to purchase these after struggling for years with different techniques... sounds like an ad! If I opted to make my own, and I almost did, I would either make round cages from concrete remesh alternating the diameter so 4 could stack together and make a total of eight so they only took up the footprint of two cages when stored. Or just use a trellising system and tie to the trellis, these would store flat. But after seeing the TTC and the fact that they fold flat cinched it for me because space is at a premium in my small Urban Garden. 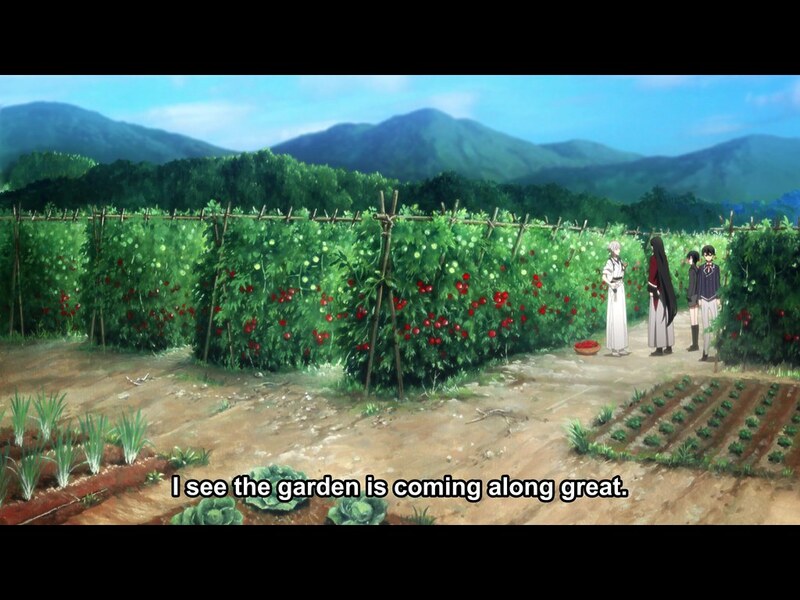 I was watching an anime and they showed a field of tomatoes being supported like this. I wonder if this is a practical method? I’m assuming individual vines are being supported with strings tied to the upper bamboo cross beams. Of course, several of the photos on this thread are missing because of changes in Photobucket. I didn't read every post but went back to look at each picture and those linked. I didn't really see the trellises that I have seen in greenhouses. Your image, AppleStar, looks like it would be suitable there. The photo I found thru the U of Illinois (attached) isn't quite what I was looking for. 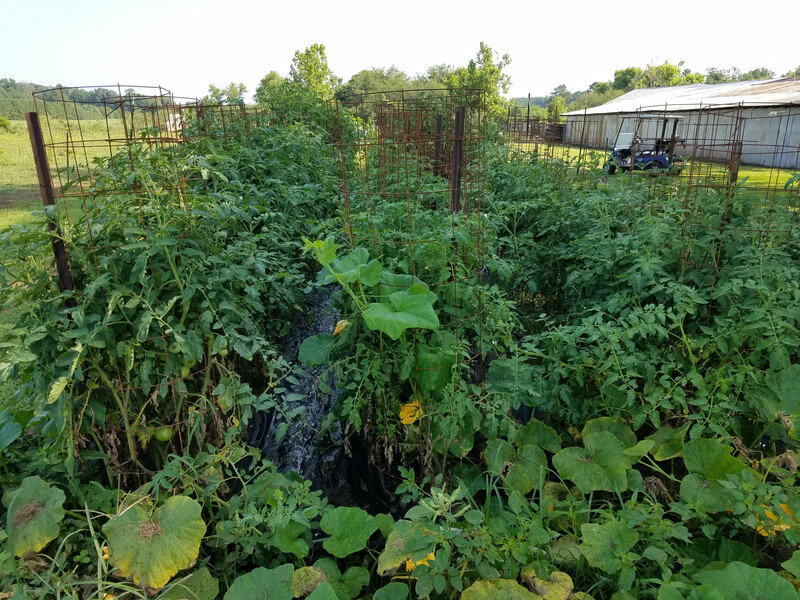 I have used a number of supports and continue to use 3 or 4 tomato cages in the backyard but I finally decided that there are just too many plants in the garden and too little time for anything but the "sprawl." From individual stakes to livestock fencing cages to Florida weave, support has worked okay. The only technique that was a fail was my own idea of a horizontal trellis with string. It's okay for my peas each year but tomato vines are just too heavy. I'd say the A-frames illustrated are much too narrow, therefore vulnerable to toppling sideways under unbalanced weight (unless driven well into the ground.) Could lean heavily the other way too, along the row axis if not braced. 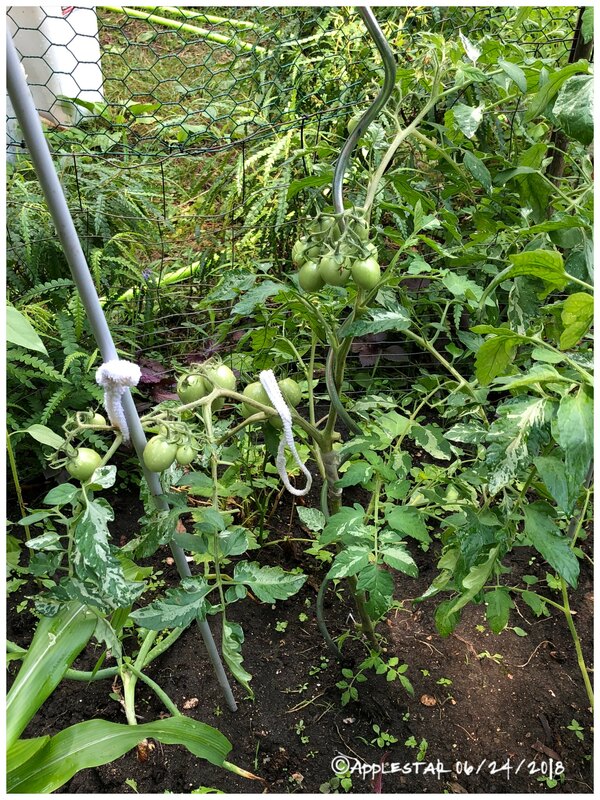 I do train my tomatoes similarly up strings, but those drop from a roof frame that's part of my raised bed; like a much smaller, more improvised version of the picture on digit's's post. I grow them covered to protect the foliage from long-term wetness. I read somewhere that this would prevent late blight. I water at ground level; previously by hand, lately with a timed drip system. I hold the vines to the strings with these clips, which work well but don't tend to last more than a season in the sunlight. Before I got them I just twisted the stems around the strings; may go back to doing that. Advantage, it's thrifty, convenient and the thickness of the string doesn't have to match the clips. Disadvantage, it's a chore to disentangle them when composting. Either way the string must be strong!